Customised colour is at your fingertips! Indulge in a palette of nail polish hues, in classic crèmes and high-fashion chromes. Then add a bit of bling with a layer of pearl, shimmer, or sparkle. Effects for nails that are dressed to impress. 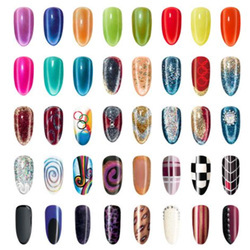 Creative Nail Design (CND) have been valued globally by beauty professionals and our clients alike since 1979. They expand the promise and possibility of beauty for hands and feet and each product is meticulously researched and tested before it ever reaches the customer.